Oh that classic peanut butter and chocolate pairing. It calls to us like a siren in the night…the day…after dinner…ok she’s always there. Stupid stalking craving siren. Now, I’m not going to be strapping myself to the mast of a ship anytime soon (oh yay, I knew that classics degree would come in handy eventually). It’s time to look this siren in the face and get the flock out of here (see? See what I did there? Yyyeah. *proud*). Cupcakes are so trendy right now, I’m simply not willing to spend so much on something I can make at home and healthier too! Have you seen the prices on these things? Pfft. Maybe on the go the temptation may be greater but right now these are much better and easy! They are just as cute too. I couldn’t find my awesome frosting tips at the time. This was done with a plastic baggie with the corner snipped off. This recipe is similar to my mexican brownies just slight differences and ofcourse a much smaller pan. Combine the flour, brown sugar, cocoa, and baking soda in a bowl. In a second bowl combine the water, applesauce, vinegar, margarine, and vanilla. Pour the wet mix into the dry and stir until the batter is smooth. Fill each cup in a 12 count mini muffin tin about half full. Bake at 350F for 13-15 minutes. Cool. Combine the defrosted cool whip and peanut butter in a bowl. Fill a frosting bag or even a small plastic baggy with the end snipped off. Frost the cupcake mini’s when they have cooled completely. Serve. Makes 28 mini cupcakes. Each serving contains 22 calories, .4 gram of fat, 4.2 carbs, .3 gram of fiber (based on regular flour), and .6 gram of protein. They look so adorable when brought out on a tray to serve to folks or even for just a night in with something special. I found that this recipe makes more frosting than I actually used. So, you can go really nuts with these things just like the ones you see in the shops. 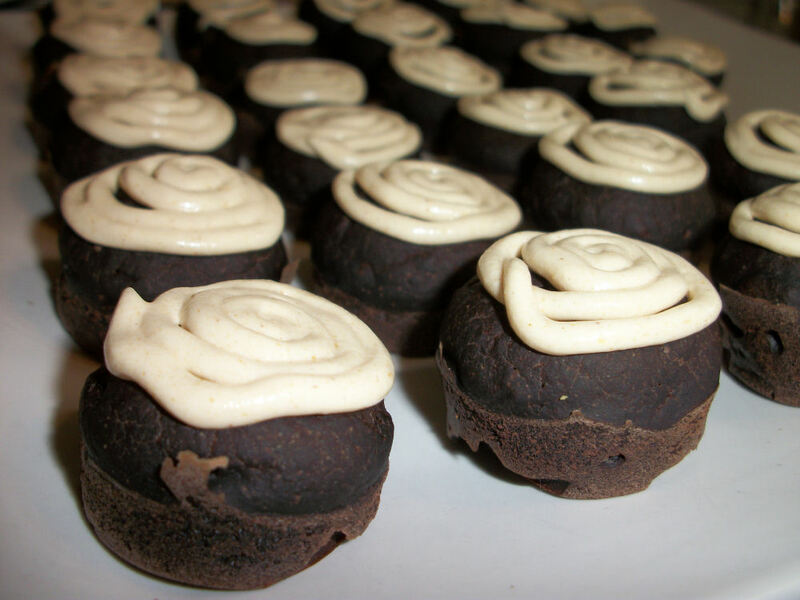 Another fun idea is to cut those bites in half and fill them with the frosting to create a whoopie pie style cupcake. Num! This entry was posted in Comfort Foods, Craving Buster, Dessert, Snack and tagged apple, chocolate, peanut. Bookmark the permalink.